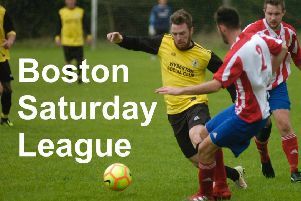 Boston Town dominated bottom of the league side Huntingdon on Saturday, winning 6-1. The struggling visitors never truly looked in the game despite trying to match the physical intensity of the Boston players throughout, writes Tristan Simpson. The result was the Poachers’ biggest win in six years and served somewhat to emphasise their inconsistency through the 2015-2016 season so far, having registered their third win in a row after a long run of defeats. The game begun with the Poachers controlling the play. However, their failure to convert the opportunities saw them only go in just 1-0 up at the interval. Alex Beck and Jack Wightwick had brilliant opportunities to score early on in the game, but both failed to capitalise. They also found Huntington keeper Carl Mackney a thorn in their side, pulling off a string of fine saves. The deadlock was finally broken in the 35th minute when Jason Field placed a curling free kick into the top corner from just outside the area. The second half begun with increased potency, with the home side extending their lead within the first minute. Alex Beck dribbled the ball through three defenders to the by line before passing back to Ryan Parnell, who scored his first goal since joining Boston. In the 68th minute, the game was firmly into Boston’s grasp with Wightwick scoring his 14th goal of the season. After being placed through on goal he took his opportunity with a fine finish into the corner of the net. The Poachers were well into their stride added another goal in the 73rd minute through Beck. Despite Boston dictating the play their concentration lapsed and a minute later Huntingdon pulled a goal back through Alex Shepherd’s long range strike which found its way past the despairing James Doughty. However, the goal was against the run of play and as the Huntingdon’s defence tired, Boston eased to victory with Beck, who deflected Parnell’s long range effort home in the 83rd minute, and Eyett slotting the ball in the net late on. After this emphatic win, the first time they’ve scored six in the league since Boston now sit 11th in the division with high hopes of pushing into the top half of the table in the coming games. TOWN: Doughty, Lambley, Field, Borbely, Wood (capt. ), Ashton, Eyett, Ford, Beck, Parnell, Wightwick; Subs: Moore-Papworth, Angel. Town inflicted county rivals Holbeach United’s second defeat of the UCL Premier season upon them last Wednesday. Goals from Jack Wightwick and Simon Ashton saw the Poachers get the better of the Tigers at Carter’s Park, United’s first defeat in the league since the opening day of the campaign. Mark Angel’s side - who also beat the Tigers 5-0 in the county cup - took the lead through Wightwick’s 25-yard chip, his 13th goal of the campaign. Town went 2-0 up on the hour when Ashton forced home following a move including Aaron Eyett and Richard Ford. Gary King gave Holbeach hope in the 70th minute, but Town stood firm. Ex-Poacher Ollie Pinner was sent off late on. TOWN: Doughty, Lambley (Borbely), Field, Fleming (Parnell), Wood, S. Ashton, Eyett, Ford, Beck, Nuttell (Moore-Papworth), Wightwick.